All Winged Beast monsters gain 200 ATK/DEF. 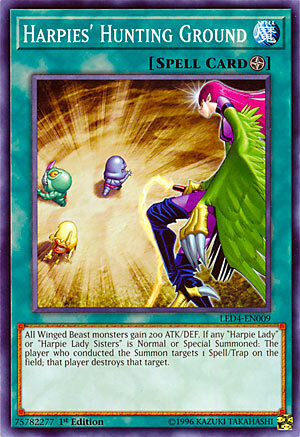 If any “Harpie Lady” or “Harpie Lady Sisters” is Normal or Special Summoned: The player who conducted the Summon targets 1 Spell/Trap on the field; that player destroys that target. Originally this was going to be Harpie Lady Sisters, as we’ve talked about her all week since the new support wanted you to use her, but considering how simple her effect is, if you can even call it that, and how the card isn’t really that good to where I don’t even think it is worth reviewing nor would make for an entertaining review to read, we went ahead and changed it to Harpies’ Hunting Ground. Harpies’ Hunting Ground is a Field Spell for the Harpie archetype that boosts all Winged Beast monsters by 200 ATK and DEF. Not a significant boost, but it is what it is. Any free ATK boost isn’t really something to complain about If this was all the card did, then this wouldn’t see the light of day just like how Harpie Lady Sisters isn’t now, but there’s more. If any Harpie Lady or Harpie Lady Sisters is Normal or Special Summoned, the player who conducted the summon targets and destroys 1 Spell/Trap on the field. Hey, Spell and Trap removal is still something nice to have in 2019. There are still a few Spells and Traps your opponent can activate or set and be threatening to you, so destroying them is great. It is mandatory, so if you summon a Harpie Lady and your opponent controls no Spells or Traps, one of yours are going. Most to all the Harpie monsters in the Main Deck are treated as Harpie Lady, whether just in general or just on the field/in the GY, so seeing as you are most likely playing this in a Harpie deck, your summons will be dangerous to all Spells and Traps on the field. Thankfully as we saw earlier this week there are a few Spells and Traps you can pop in the Harpie deck with this to get effects to make up for the mandatory pop. Another good card is Hysteric Sign to pop and get 3 Harpie monsters to your hand in the End Phase. Another thing to note is that if you are in a mirror match, your opponent can take advantage of your Harpies’ Hunting Ground, but even with how fun Harpies can be, a mirror match won’t be that common. When worst comes to worst, Hunting Ground will just pop itself, but you would of likely destroyed some of your opponent’s Spells and Traps first if not the cards we reviewed earlier this week or Hysteric Sign. Hunting Ground is also searchable off Terraforming and Harpie Queen, which Queen herself has cards that can search for her, so Hunting Ground has enough good qualities to warrant running. Two is fine since it is searchable and doesn’t offer the most game-breaking advantage, unless you can summon a ton of Harpie monsters and your opponent doesn’t have many chainable Spells or Traps set. Art: 4/5 Harpie Lady is on the prowl on those pesky Ojamas. Harpie’s Hunting Ground is our Throwback Thursday this week. Austin had originally chosen Harpie Lady Sisters (which, terrible as it is, was appropriate given the week) and I’d suggested Icarus Attack (which we didn’t do, given it’s not specific Harpie support) and we literally about the same time ended up deciding after conversing to make this instead. This has had one review previously, upon its release in January 2005. This is theme specific, appropriately, and all Winged Beast Monsters gain 200 attack and defense. Wind (Winged Beasts) aren’t a terribly common Deck to face, nor would Harpie be, so I honestly don’t see that as an issue…I don’t see you playing against a similar opponent maybe but 1 in 100 times. Given the overall weakness of most of the Harpie cards, the attack boost is negligible, but appreciated I suppose. Any Normal or Special Summon of a Harpie Lady (or Sisters) generates a Mystical Space Typhoon for you. This is also non-targeted destruction, which I also appreciate, and can help to protect you, as well as helping to generate some advantage for your Field. Harpie cards still aren’t particularly great at generating a great deal of advantage on their own. Worth noting, this destruction effect is limited to your opponent. If you have Magic or Traps on your Field and your opponent doesn’t, you will be hitting one of your own…worst case scenario likely would be you end up destroying the Hunting Ground itself. This is a Field Magic, so Terraforming does come into play, as will Harpie Queen for a search (QUEEN OF THE HARPIES…I would have loved that card for that reference alone to be done today). This is on the good side of average for the player. It isn’t so powerful that we’d consider it broken, and that it can/has to hit your cards if necessary helps add an intelligent level of balance to it, in my opinion. Art: 3/5 Meh, Harpie is apparently hunting the Ojamas. The gold spiral there is nice, as if perhaps she’s swooping in or just having finished attacking?